Fortunately, the majority of diseases humans develop over their life-time are non-lethal. Patients will go though some rough time but eventually recover to a healthy status again. Think of the common cold, many infections, local inflammations, etc. In all such cases the readings of physiological parameters return to normal. Since they do not jump back in one leap there is a gradual improvement that can be monitored by repeated measurements of the corresponding parameters. This way, a positive response to a treatment can be detected long time before the improvement of the patient becomes obvious. This also is true for patients with potentially lethal diseases (such as leukemia or other forms of cancer). Molecular diagnostics is capable of detecting changes due to treatment very early, either positive or therapies that are not improving or even worsening such biomarker readings. This allows doctors to quickly terminate or change non-beneficial or damaging therapies early on, thus minimising the damage done by side effects of the drugs. Another very important application of molecular diagnostics is monitoring of a progress-free state. Many patients such as leukemia patients can enter so-called “remissions” either on their own or induced by successful treatments. In a remission the patients either stay at the current state of disease without disease progression or they even improve their health status. Such remissions can last for weeks, months or even years and are usually terminated when the tumour cells have mutated Ito allow them breaching the body’s defence again. Such unfortunate events will ultimately lead to the recurrence of disease symptoms and deteriorating health again. However, this is often proceeded by a shift of pertinent body parameters towards disease-correlated values (e.g. the occurrence of a new mutation in circulating tumour cells in the blood). Early detection of such changes allows doctors to determined the time to start and the type of therapy to choose before the patients health has been severely compromised. The hope is that such monitoring will allow quenching threats to the remission before they can actually take a hold in the body. 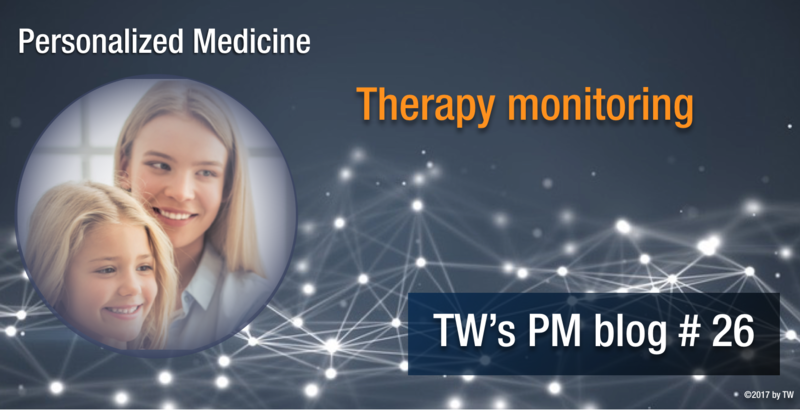 Following treatments can be done by monitoring specific biomarkers that were targeted by the therapy or general biomarkers indicating health or disease. The latter are often metabolic markers, or cell counts in the blood in case of leukemias. Specific markers could be the abundance of a somatic tumour mutation, indicating shrinking or growing of a particular tumour subtype. Looking for new somatic mutations in general is already at the brink of new molecular diagnosis and stratification. 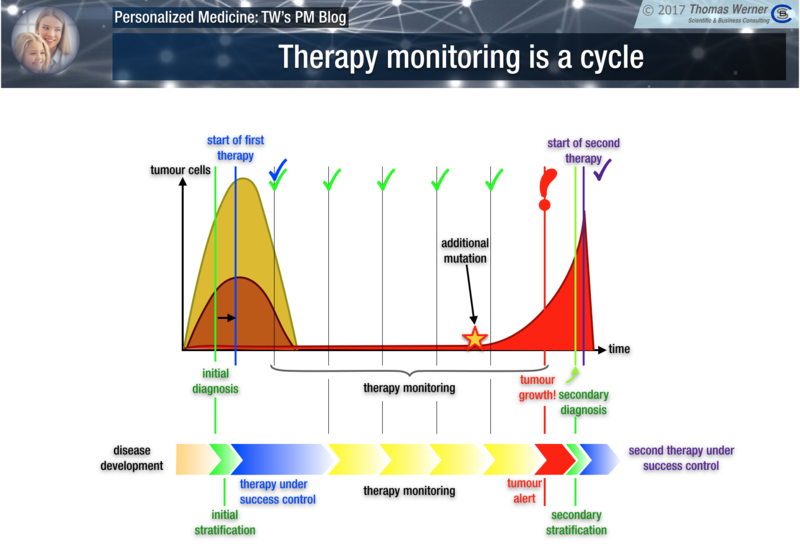 However as mentioned in a Nature Medicine editorial in June 2017 molecular diagnosis - in my mind including therapy monitoring - needs not only to detect specifically and sensitively tumours somewhere in the body. It also has to differentiate between the emergence or re-emergence of life-threatening cancers or other diseases and “tolerable” situations. In such cases therapy might not be required or may even be detrimental to the patients. In summary, therapy monitoring is done to buy reaction time by recognising changes long before they become clinically manifest. This not only allows earlier and better tailored new therapies but also prevents the damage caused by late or wrong therapeutic interventions. Next week I will start to address the individual stake holders and outline some of their possibilities and obligations required to make personalised medicine a success for all of us.